In Indiana in 1964 best friends Cynthia and Gus decide to learn what happened to the former’s great-grandfather Beau who vanished in 1915 while on a business trip. The two best friends enter the attic of Cynthia’s home and the trunk sends them through time where they avoid being alligator bait thanks to some bologna Gus had. The quickly learn it is 1914 when they meet octogenarian Mouton” Mud Bug” Boudreau who warns the two young girls to avoid pirates like Buzzard Jack LaBuse. He begins taking them by canoe to New Orleans when he and his boat vanish. The two buddies find themselves in 1844 where Jasmine is quite nice to them and so is her ten years old son Mooty called Mud Bug by everyone. From there the clues take them to 1915 and the farm of Samantha Connor whose spouse Beau vanished last year on a business trip in New Orleans. The girls know they are getting closer to finding Beau but wonder where they will go next in time. 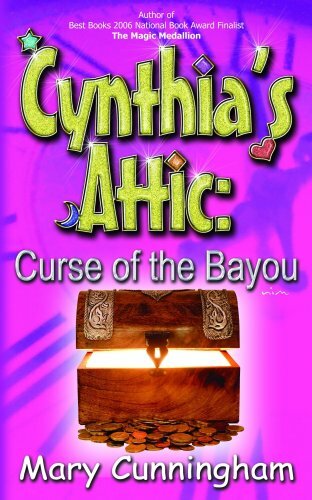 The third Cynthia’s Attic young adult time travel mysteries (see Magic Medallion and MISSING LOCKET) is a fabulous tale as the two intrepid best friends journey back and forth through time. The preadolescent pair remains consistent even with Gus having some non hunger moments while the support cast especially Mud Bug as an elderly person and a child make for a fun Bayou adventure with a fantastic final twist setting up the next entry.